The Thiruvelliyankudi temple is situated in Thanjavur District, Tamil Nadu, near Senganoor bus stop. The temple can also be reached through Chozhavaram, Muttakudi and Mayavaram. 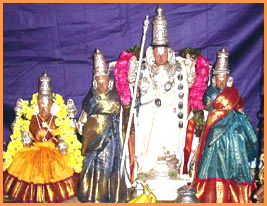 The deity of this temple is Lord Kola Valvilliraman. His idol is seen in a sleeping position, facing the east. This temple is constructed at the very place where Kola Valvilliraman is believed to have blessed Shukra, Indra, Brahma, Sage Markandeya and Sage Parasara. Worshipping in this temple is therefore considered to be equal to worshipping in the 108 major temples in Tamil Nadu. Garudan, the divine vehicle of Lord Vishnu, is seen holding ‘sangu’ (couch shell) and ‘chakram’ (a discus shaped weapon), weapons that are normally seen in Lord Vishnu’s hands. Many sages and saints of ancient times are said to have performed a special worshipping ritual called as ‘Vyasa Puja’ here. One who worships the diety at this Kshetra is said to have earned the credit of worshipping the dieties at all the 108 Divya Desams. Sri Garuda has the Shanku and Chakra only in this Kshetra. The famous place, Chenganoor, is the birth place of Sri Periyavachan Pillai. On the route from Kumbakonam to Anaikkarai. Alight at Chenganur Junction.The Kshetra is located 2 miles from here. On the route from Aduthurai to Anaikkarai. Alight at Muttakudi, from where the Kshetra is about 5 Kms. The Moolavar of this sthalam is, Sree Kolavilli Raman He is giving his seva in Kidantha Thirukkolam in Bhujanga Sayam facing his thirumugham towards east direction. Prathyaksham for Lord Shukran, Brahma, Indra, Parasara, Mayan, Markandeya Maharishi and Bhoomi Piratti. This temple lies in the District of Tanjore, Tamil Nadu. From Kumbakkonam, we have to travel in a bus upto Anaikarai and from there to Senganoor and the temple is about 3/4 kms away from this place. The Sthalam can also be reached Via Chozhavaram, Muttakudi and Mayavaram.